(Photo: Reuters / Baz Ratner)Michael Nazir-Ali, the Bishop of Rochester, addresses the Global Anglican Future Conference (GAFCON) in Jerusalem June 24, 2008. Bishop Michael Nazir-Ali, the former Anglican Bishop of Rochester in England and co-head of the Anglican-Al Azhar Dialogue on monotheistic religions, has argued that democracy alone is not enough to ensure peace and equality in the Middle East. This is especially given the continued influence of Islamic sharia law, as traditionally understood, which has historically relegated women, Christians and religious minorities to a second-class status he said in a speech hosted by Christian Solidarity International in Zurich on May 30. 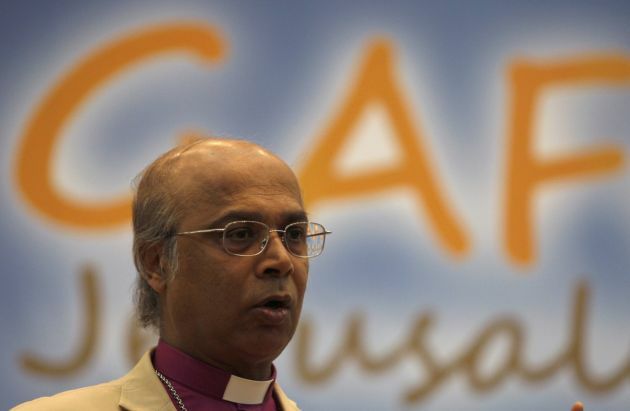 Nazir-Ali , is a Pakistani-born scholar who resigned as Bishop of Rochester in 2009 to train Christians facing persecution as director of the Oxford Centre for Training, Research, Advocacy and Dialogue. He became a Christian at the age of 15 and aged 20 he became an Anglican. Two day before his speech he said in an interview with Britain's Telegraph newspaper that, "the churches have generally capitulated to secular culture and therefore cannot bring a distinctive voice to public debate." In his Zurich speech he warned against the rising threat of a "tyranny of the majority" in countries affected by the recent Arab revolutions, and called on all concerned to commit themselves to equal rights for religious minorities and women in these countries. Noting that humanity lives in world-changing times, the bishop referred to a recent attack in London on a soldier who was hacked to death by two men and a similar attack in France by people who regard themselves as converts to Islam. At first the media reported politicians saying the London attack was done by "lone wolves", but the bishop said it emerged there is a connection with bigger groups and that the people were acting in connection with others. "Quite often the tendency is to say such action the acts of small minority," said Nazir-Ali. "And yet the more I look at situation in the Middle East I realize you can't just limit these types of actions to lone wolves. "The background is one of what we may call Islamic resurgence," he said while acknowledging that there can be positive aspects to this resurgence, although this is generally not the picture. The bishop said that the Holy Land, Iran and Pakistan were once places where people of different faiths such as Christianity, Islam and Judaism were at ease with one another, but that the "the situation has been changed beyond all recognition. There are particular tensions with Christians." He said this occurred partially because both Christianity and Islam are missionary religions. "So we are in many aspects competitors," said Nazir-Ali. In his lecture, entitled, "The Arab Spring and its Aftermath: Implications for Muslim-Christian relations," Bishop Nazir-Ali criticized what he called the Western "love affair" with democracy promotion in the Middle East. Bishop Nazir-Ali pointed to several Middle Eastern countries where Western intervention to promote democracy had failed because of a lack of protection for fundamental rights. These include Iraq, where Christians have been "savagely attacked," Syria, where a "delicate balance" between religious groups is threatened by the possibility of a "Salafi-Wahabbi government …facilitated by what the Western powers and Saudi Arabia and Qatar are doing at the moment." He also cited Afghanistan, where political freedom has increased, "but not for the Christians," especially Christian converts from Islam, who still face imprisonment and execution. Bishop Nazir-Ali said the events in those countries, as well as the Arab revolutions and the recent Islamist terror attacks in London and Paris, are occurring "against the backdrop of an Islamic resurgence" that affect both Shia and Sunni Islam. The bishop warned of a coming "huge-scale Shia-Sunni conflict throughout the region," which will determine the fate of the region's Christian groups. Nazir-Ali argued that countries affected by the Arab Spring must commit themselves to three principles to make a successful transition to states governed by the rule of law: "one law for all," as opposed to different laws for different religious groups, equality before that law, and "common citizenship" for men, women and all religious groups. His speech was part of a series of lectures hosted by Christian Solidarity International on the future of religious minorities in the Islamic Middle East. Bishop Nazir-Ali is theologically conservative and opposes the ordination of actively gay clergy. He now president of Oxtrad, which "prepares Christians for ministry in situations where the Church is under pressure and in danger of persecution". He has said that that as well as ignoring the current persecution of Christians in the Islamic world, secular Britain brushes aside historical evidence of Muslim aggression. Another CSI-supported conference, "The Future of Religious Minorities in the Middle East, North Africa and the Two Sudans," will be held at St. Antony's College at Oxford on June 7-8.